We're kicking off the second week of the Frilly and Funkie challenge today. 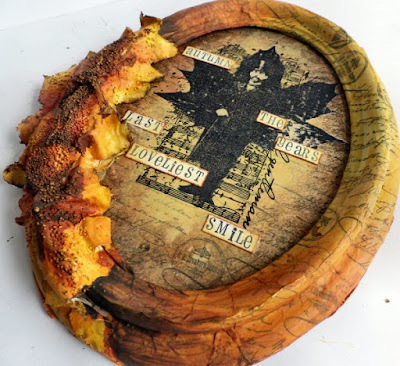 I am the host for this challenge and it will also be my last post for a while as I'm taking some time out. 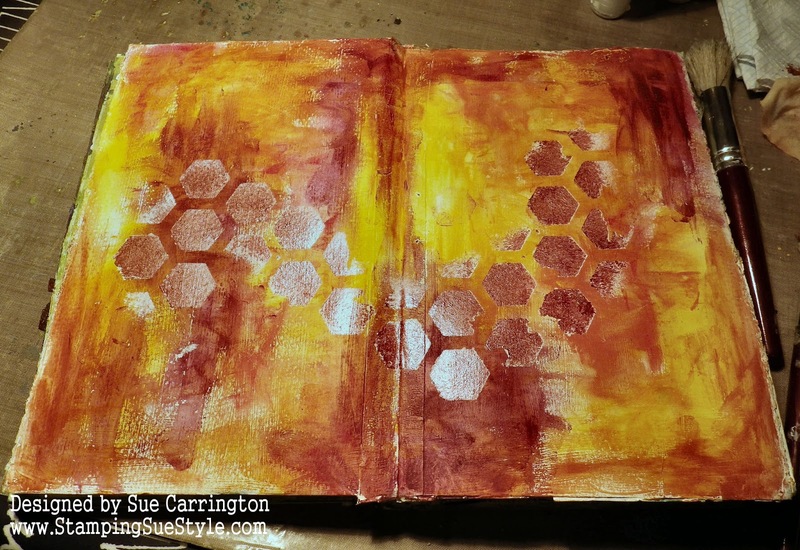 The theme I've chosen for this challenge is circles. 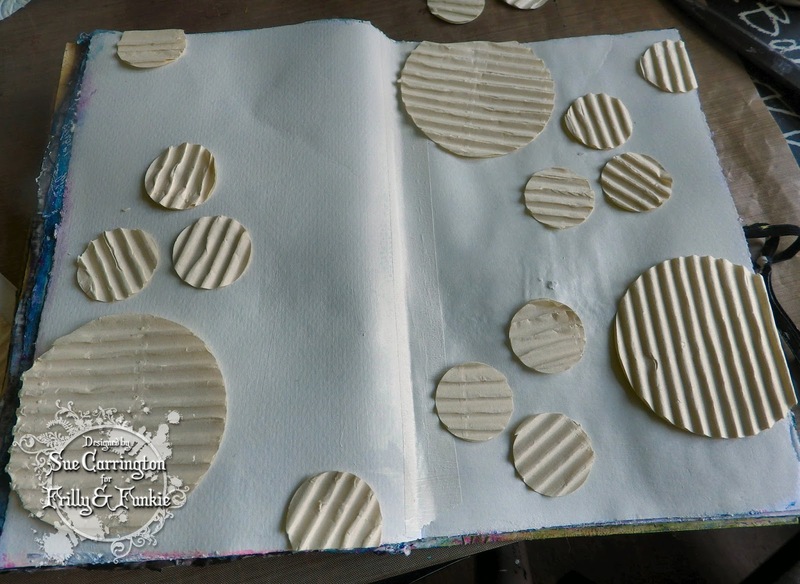 Including circles in my projects is one of my favourite things to do, so for this challenge I want to see circles, lots of circles, not just one! Stencilled, stamped or even a circular project such as a wreath! 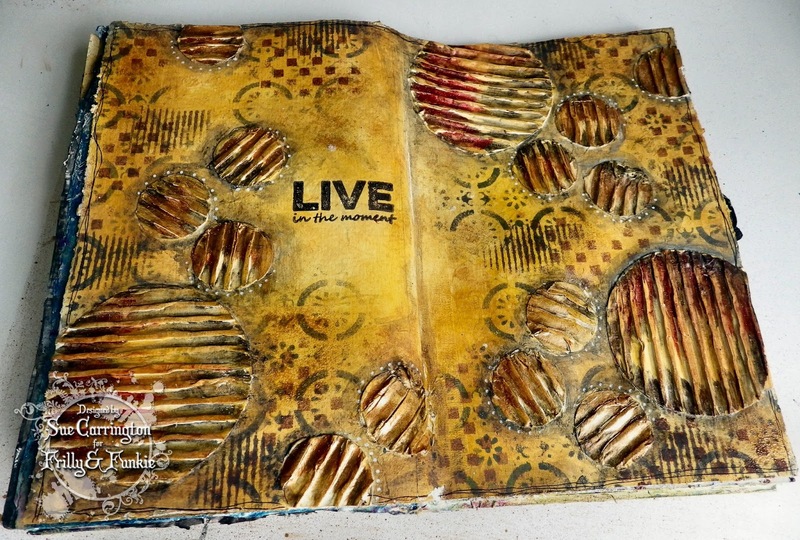 I started by punching some circles from corrugated cardboard. I then applied acrylic paint and blended it around the page using a baby wipe. 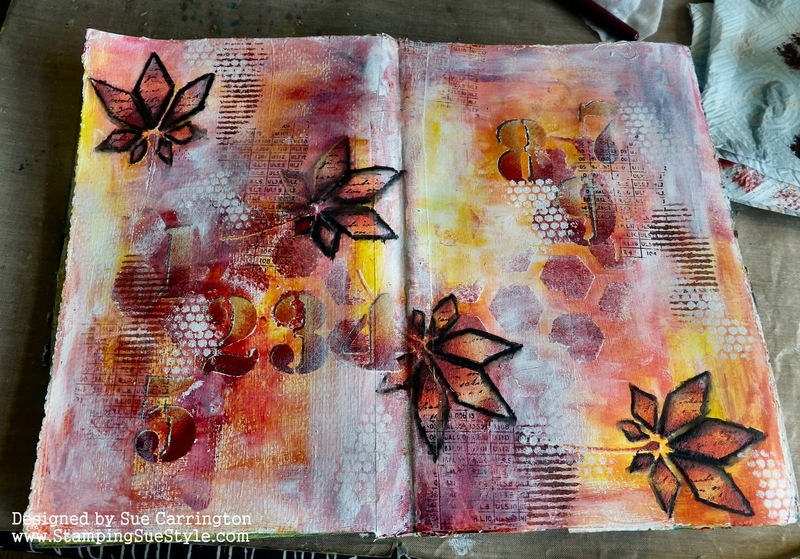 I then used some stencils with acrylic paint around the page. To give the circles more definition I used a grey acrylic paint around them and blended the paint out using a baby wipe. 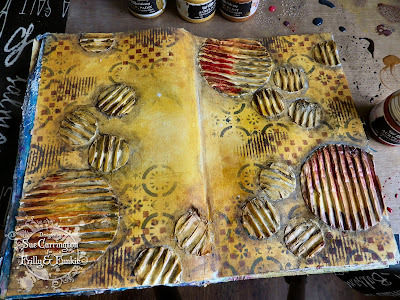 To make the circles stand out even more I used the Prima Art Alchemy paints and again used a baby wipe to blend the colours. 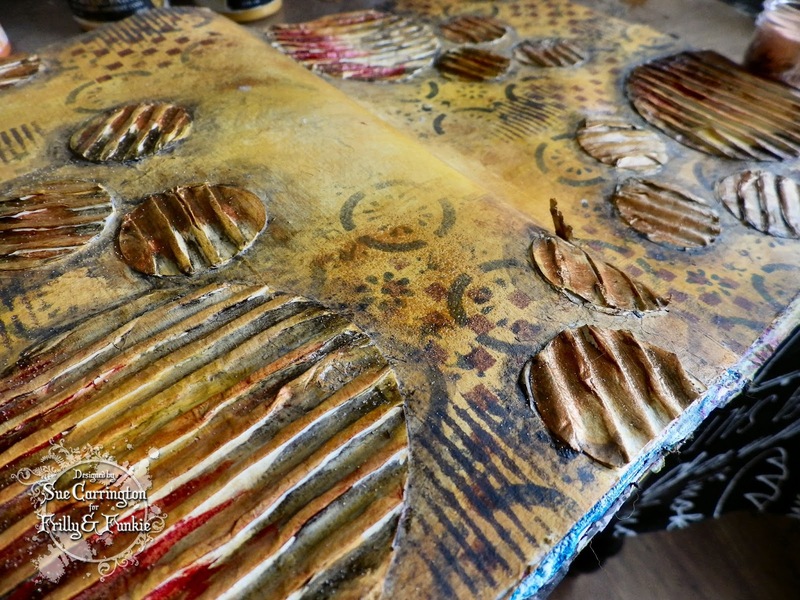 You can see from this shot how the paint gets caught in the dips of the cardboard. 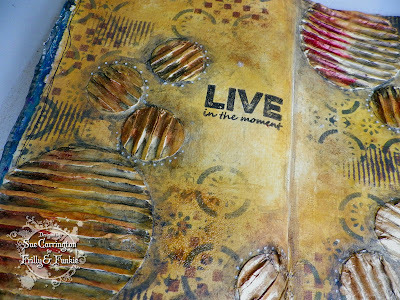 The sentiment was stamped with black Archival ink. I doodled around the edge of the page and used a white Sharpie pen to add some white dots. One last close up shot of the text. 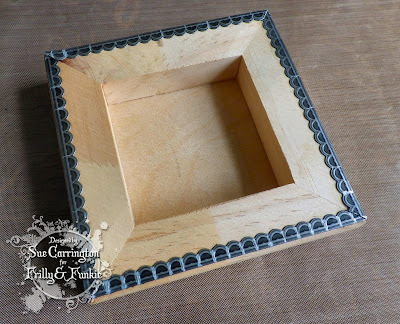 I hope you can join us for this challenge and do make sure you hop over to the Frilly and Funkie blog to see the rest of the DT's fabulous projects. Hello ! It's rare these days to see me here on a Monday but today I'm sharing a project over on the PaperArtsy blog. 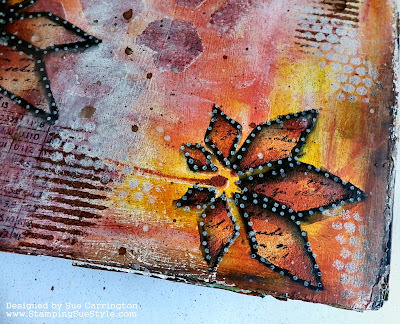 The current theme is Autumn Leaves which is right up my street as these are my favourite colours. 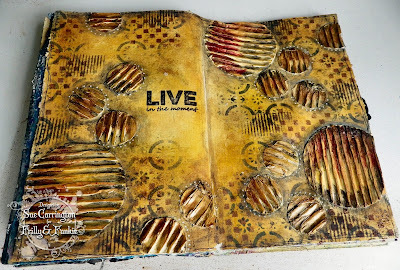 For all the details of how this project came together you'll need to hop over to PaperArtsy. I have chosen the theme Things with Wings for this one. 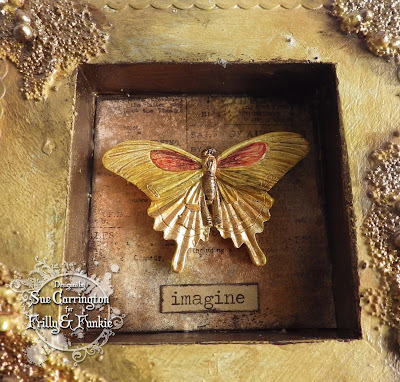 I would like to see anything that has wings, use your imagination... just make sure your project is shabby chic or vintage in style. 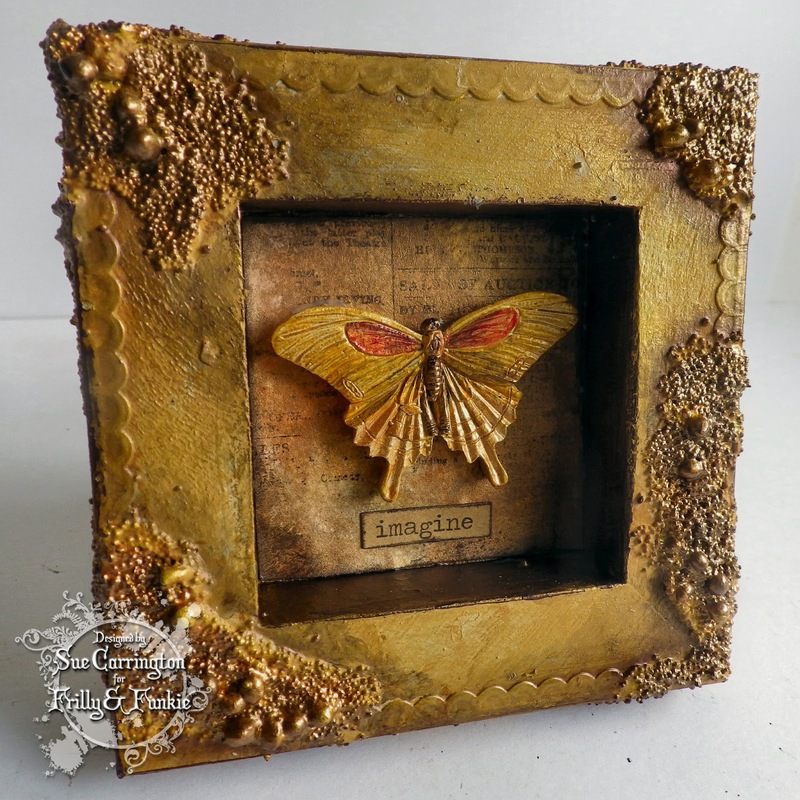 I had one of these little Artemio wooden frames left and decided to use it to showcase a butterfly. I started with Tim Holtz Industrious Stickers around the edge. 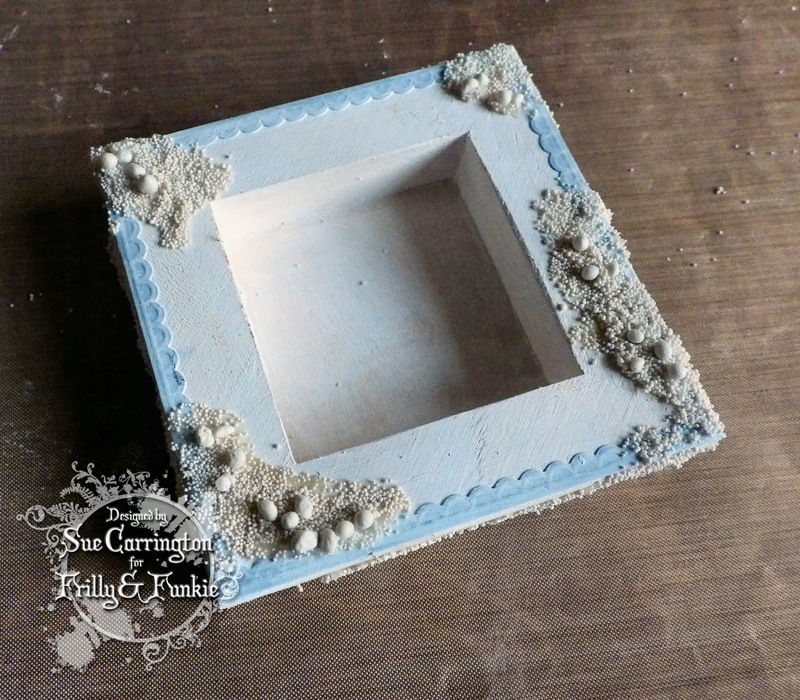 I painted it with Gesso then glued Art Stones and Mini Art Stones around the frame. I'm afraid the process over took me and I didn't capture the rest of the steps before the finished project ! I used Acrylic paint to build up layers and then used Prima Art Alchemy paints just over the Art Stones and then on the inside of the recess. 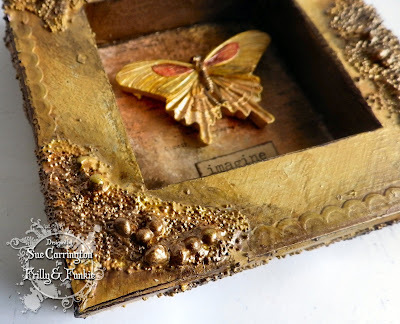 The backgound for the butterfly is white card that's had the Prima paints dabbed on to it using a baby wipe. 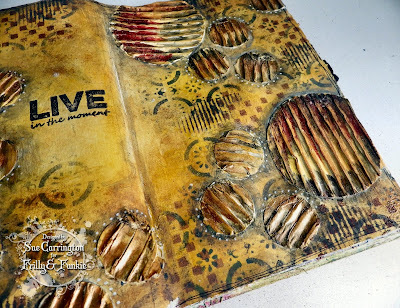 Then I stamped the Tim Holtz Newsprint stamp over it . The butterfly is by Prima and it's also been painted with the Prima Art Alchemy paints. To make the frame a little more shabby I used Blackberry Prima Art Alchemy paint and watered it down and painted it around the textured areas. The final touch was a chit chat sticker that I dabbed Blackberry around the edge. I hope you get chance to join us for this challenge and do make sure you hop over to the Frilly and Funkie blog to see the rest of the DT's projects. 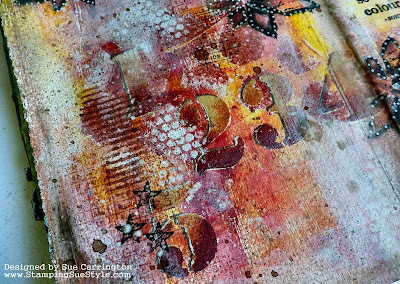 I'm back today to share my DT project for the new challenge over at Stamps and Stencils. 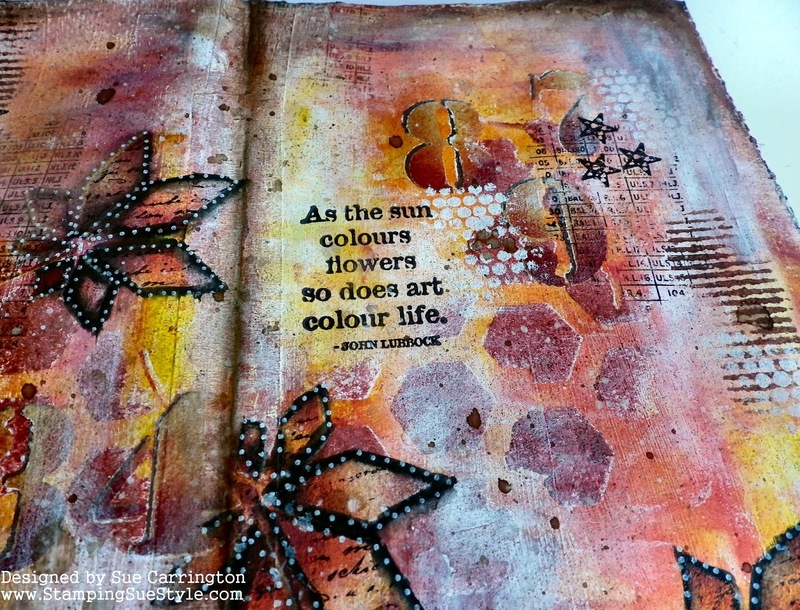 Rachel is our lovely host and has chosen the Colours of Autumn as our theme. 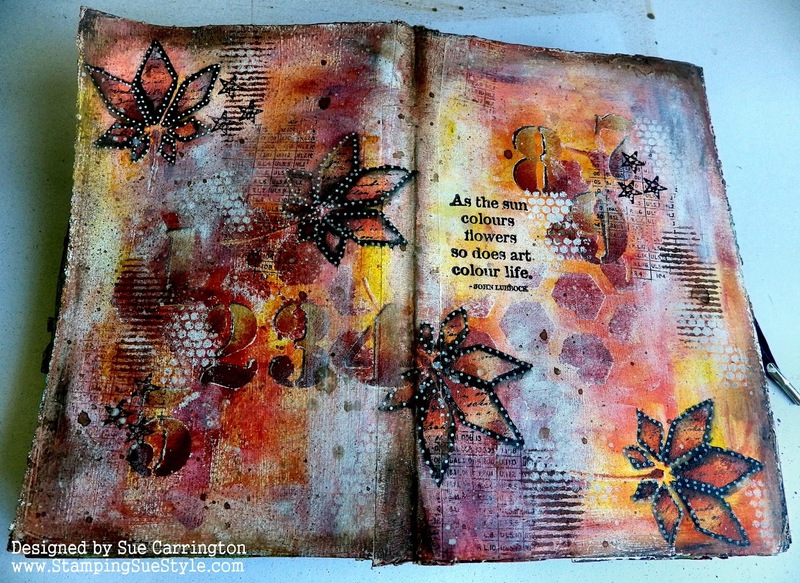 This is not about using leaves but using the colours associated with the season of Autumn. These colours are right up my street so the only decision was what to do with them ! 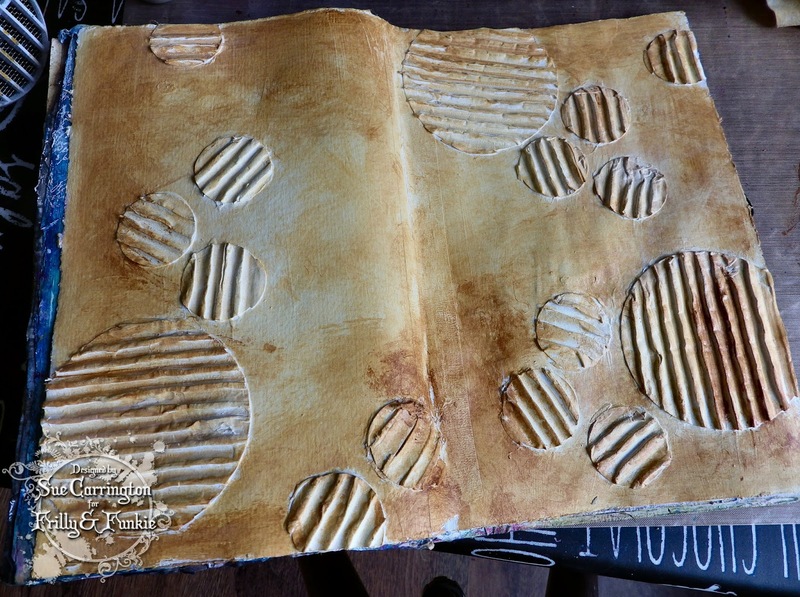 I've been enjoying doing some pages in my journals lately so that's where I headed for this challenge. 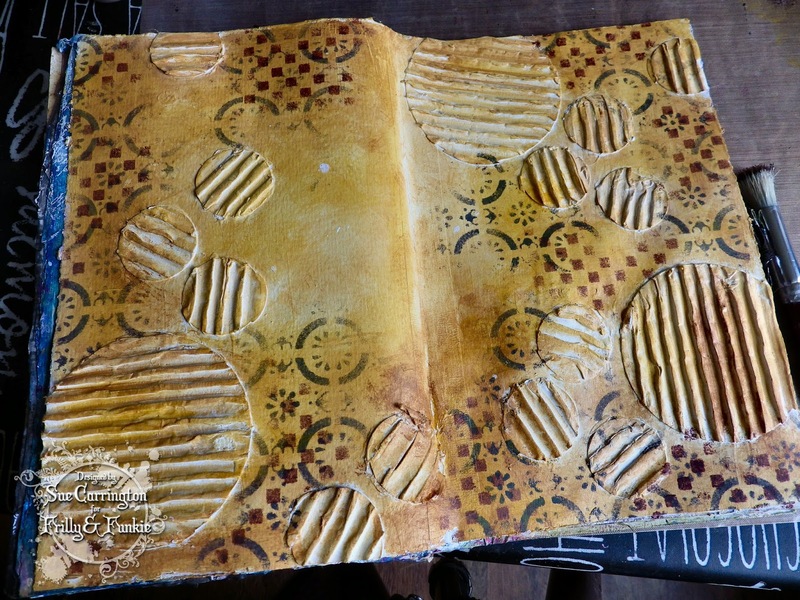 The pages were Gessoed and then I used my fingers to blend Autumnal Fresco Finish colours over the pages. I used the Copper Fresco Finish with a Donna Downey Honeycomb stencil. 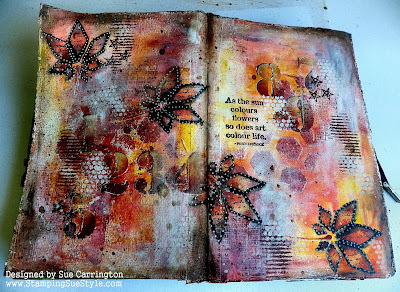 Although leaves weren't compulsory for this theme once they were in my head there was no getting away from them! 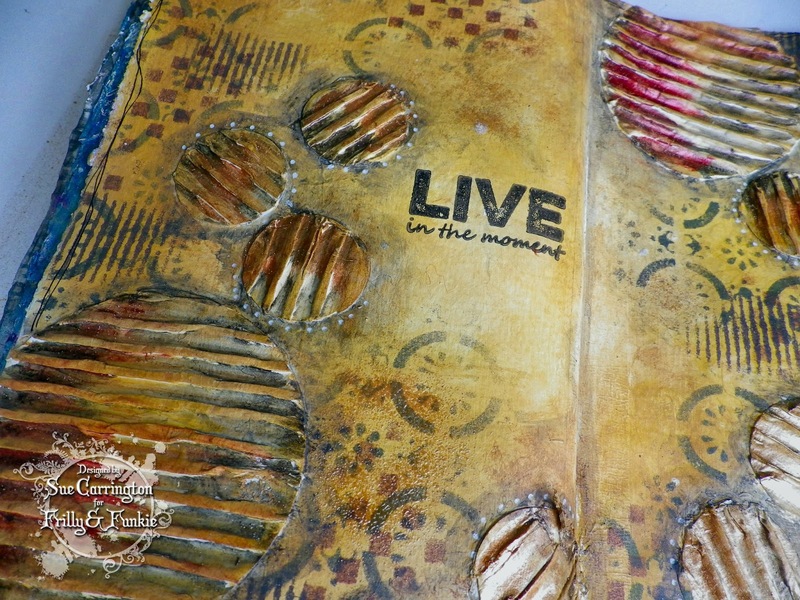 I used a Lin Brown stencil and did several layers of stencilling, replacing the leaf stencil after each colour. I've skipped ahead a few steps here ! I first of all used a TCW numbers stencil, again doing several layers of stencilling and using the 'bumping' technique to make the numbers pop. I drew around the leaves with a black Stabilo pencil and blended it out using a damp paint brush. 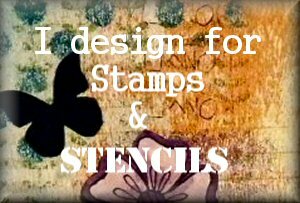 I replaced the leaf stencil then used a script stamp to stamp through the stencil. Using my finger I've rubbed Snowflake Fresco Finish paint over areas of the pages, love how this knocks the colour back. 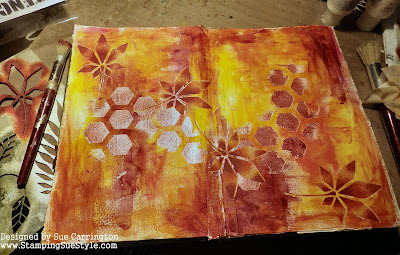 Some more stencilling and I've also done some stamping without an acrylic block. 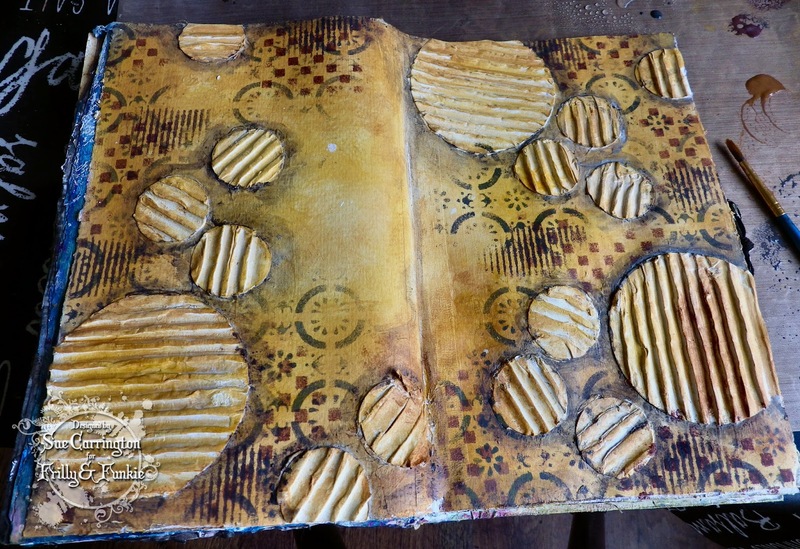 I used black Archival but decided it was too harsh so while the ink was still wet I rubbed it back using a baby wipe. 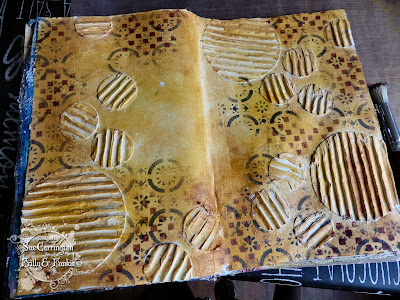 To finish the page I've used a Lin Brown stamp for the quote and I've brushed Prima Parthenay Artisan Powder around the edges and down the centre. I wanted it a little more grunged so again used my finger with French Roast Fresco Finish around the edges of the pages. I sprtized the page with a Lindy's Stamp Gang spray and still feeling I needed something else I watered down some Snowflake Fresco Finish and flicked that across the pages too. A couple of close ups for you, this one you can see the stamping done through the stencil. 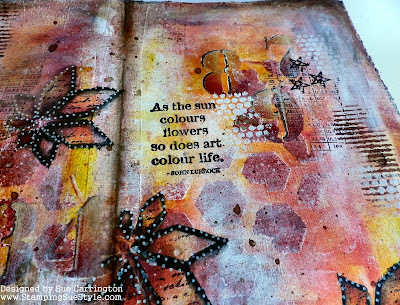 One final shot to show the quote and you can see some splattering too ! 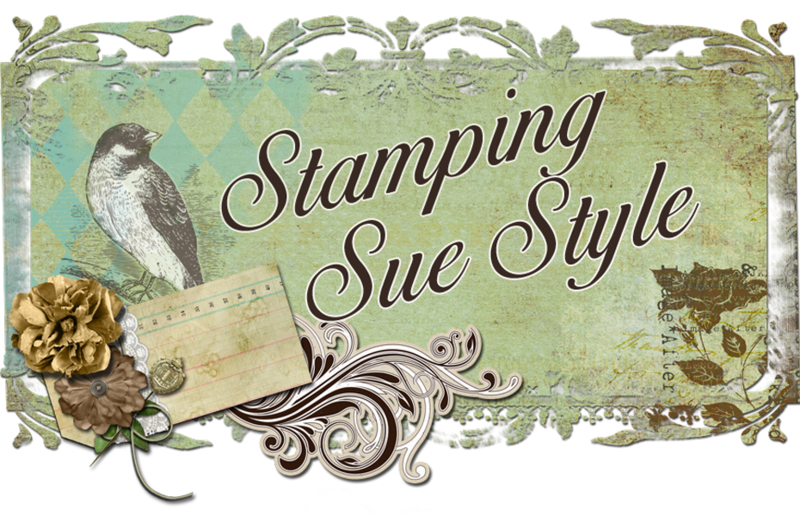 I hope you get chance to join us for this challenge and do make sure you hop over to Stamps and Stencils to see the fabulous projects from the rest of the DT.